4.3.12.10 Statement C-4 should be prepared for the general (current expense) fund, and all other governmental, and proprietary funds. Do not prepare it for trust and agency funds. Statement C-4 does not need to be prepared if the government is filing the required schedules using the SAO Online Filing option. The SAO online reporting system will automatically generate this Statement. 4.3.12.15 Local governments are required to update the incorrect financial statements. The requirement applies to all errors found prior or during an audit. 4.3.12.20 Local governments with total revenues of $2 million or less are not required to prepare C-4 or C-5 statements unless debt covenants, a contract, a grantor or the city/county/district’s legislative body requires the city/county/district to prepare the financial statements or to receive a financial statements audit. If this request is made, C-4 and C-5 statements and notes should be prepared. The $2 million threshold calculation excludes any proceeds from issuance of long-term debt and resources held by the government in its fiduciary capacity. Local governments which choose not to prepare C-4 and C-5 statements must have their budgeted information available for the audit. 4.3.12.30 If more than $750,000 in federal funding was expended by the entity during the year and a federal single audit is required, the entity must prepare financial statements if it has expenditures of federal funds from more than one program or cluster. However, an entity that normally does not prepare financial statements may not need to prepare them for the single audit if it has expenditures from only one program or cluster. Entities should consult with their local SAO team or the SAO HelpDesk if they have questions about this requirement. An additional GAAP basis report only for their utility funds. 4.3.12.50 Instructions for preparing GAAP basis financial statements can be found in the GAAP BARS Manual. 4.3.12.60 Sometimes governments will create other funds for internal accounting or managerial purposes. When preparing annual report schedules and financial statements, any such accounting or managerial funds should be rolled into appropriate fund types. For example, there should be only one general fund reported, even if several fund numbers are used internally for different general fund programs; or if several funds are used internally to account separately for operating capital and/or debt activities of proprietary function, those activities should be rolled up into a single enterprise fund. a. To prepare, enter the beginning reserved and unreserved amount of cash and investments (3081000 and 3088000). In line below should include any prior period adjustments (accounts 388/588). 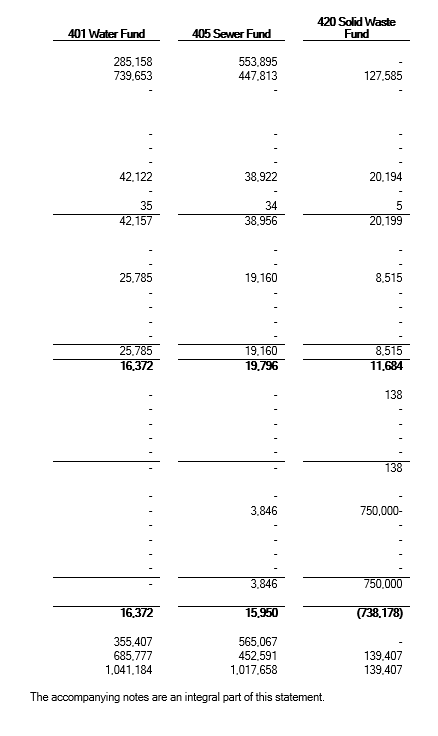 Then list revenue accounts (310, 320, etc.) and expenditures (510, 520, etc.). The other increases in fund resources should include: debt proceeds (391-393, 596), transfers-in (397), special/extraordinary items (385/585), custodial activities (389), and other resources (381, 395, 398). The other decreases in fund resources should include: capital expenditures (594-595), debt service (591-593, 599), transfers-out (597), custodial activities (589) and other uses (581). Display of the reserved and unreserved ending cash and investments (5081000 and 5088000) is required. b. Beginning and ending cash and investments on Statement C-4 should equal the beginning and ending cash and investments on Schedule 01. These amounts should also agree to the beginning and ending cash and investments on Schedule 11. 4.3.12.70 Each fund should be presented in a consolidated manner. That is, any intrafund activity, representing transactions or transfers occurring within the fund between departments, programs or managerial funds, should be eliminated. 4.3.12.80 Fund names should be appropriately clear for external financial reporting purposes. The name does not need to match exactly to the fund name used in the government’s accounting system. 4.3.12.90 The Total for All Funds (Memo Only) column is a sum total of amounts reported for all funds. It is labeled as a memorandum total because interfund activity is not eliminated. 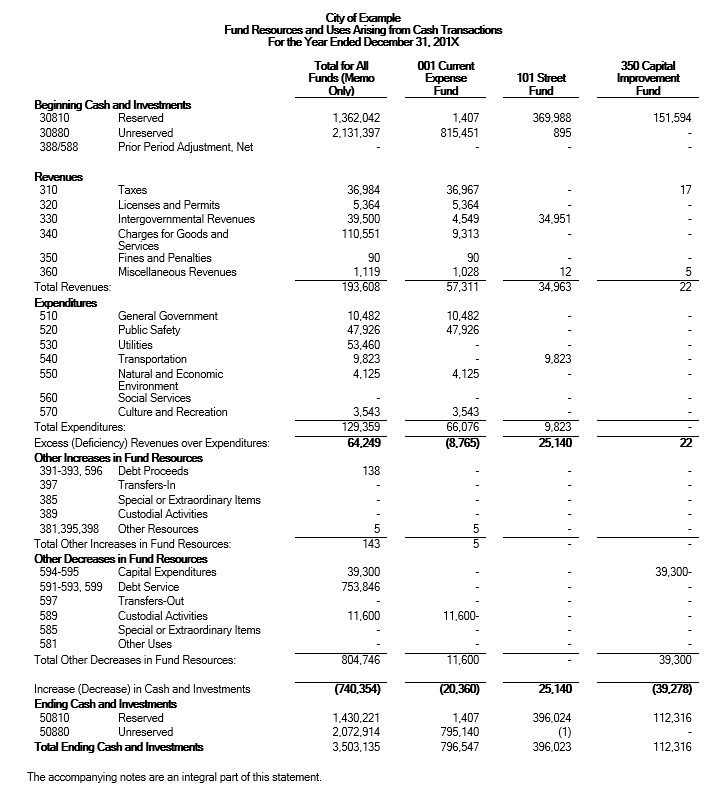 4.3.12.100 For external financial reporting purposes, amounts should be presented in whole dollars. 4.3.12.110 The Resources Database provides an internal control Checklist for Cash Basis Financial Statements Preparers that can be used as a baseline by local governments to develop control activities (policies and procedures) that address areas of deficiencies most often found in the preparation of financial statements.